version of Thore Boeckelmann's diskimage.device for AOS3.x. Thore's DiskImageCtrl program doesn't work with this device for this reason. GUI that provides the same functionality as this program and more. more diskimage formats through an extensible plugin interface. For usage instructions see the diskimage.guide file in the archive. - Fixed a memory leak in the FLAC decoder. - Fixed a memory leak in the VDI plugin. - Made DiskImagePlugin structure compatible with 680x0 version. 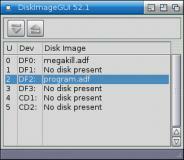 - Updated German DiskImageGUI catalog. See diskimage.guide/Changelog in the archive for a complete list of changes.